Kristal Mcvicar recently wrote a fantastic note on Facebook, where she used Bugs Bunny as the perfect example of the awakened being. As I read it, I was struck, not only by just how truly awakened Bugs Bunny really is, but how perfectly “asleep” his perennial nemesis Elmer Fudd is, in contrast. Using Buddha’s example of the via negativa, we might get just as much insight into the absence of awakening by taking a closer look at Elmer Fudd and see what emerges. Because Kristal’s structure is just so perfect, I’m going to use it in this post. It also has the added advantage of including the “awakened” position side by side with its corresponding “asleep” position. So let’s get started. 1. If you don’t know what reality is, don’t take it seriously. Elmer Fudd is almost always serious and even when he appears to be light-hearted, his real purpose is one of dark manipulation. Frankly, both Bugs and Fudd manipulate and use deception, but Fudd’s goal is always murder, while Bugs is always fun. 2. Question authority first; then ask good questions like, “What’s up Doc?” Bugs perennial question, “what’s up Doc?” is never really interested in acquiring new information. In contrast, Fudd is always reading and studying books and manuals. In vivid contrast to Bugs’ love of fun, Fudd is the failed intellectual always using what he has read in books in the vain hope of finally capturing Bugs. And, despite all of his learning, ironically, he never learns. He persists and persists in his mania for victory, yet it always eludes the head-centric Fudd. 3. Deal with your enemies by giving them, a full-on kiss on the lips. Where Bugs loves to kiss and to kiss in the spirit of fun, Fudd wants to kill and to kill in the spirit of grim seriousness. But, perhaps more to the point, the kisses of Bugs are just pure fun and totally amiable, where the sexual predilections of Fudd are inherently lustful and lascivious. There is something very creepy about Fudd’s physical desires. Where Bugs is adorable, Fudd is more than little nauseating. 4. Choose a religious symbol that is also a successful cross dresser. Where Bugs is perfectly comfortable in any outfit, Fudd is always shown wearing clothes that are painfully uncool, and often tending to have a uniform-like quality. He is nearly always outfitted to be the bumpkin hunter, completely lacking in style or urban affectation. In contrast, Bugs is lithe and sinuous in his naked animalness in perfect contrast to Fudd’s rigidity and oafishness. Also, Fudd is always dressed as the books demand he dresses. 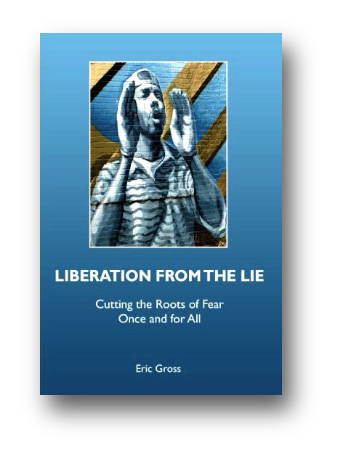 He is the pure authoritarian – always seeking orders and directions from other authoritarians. 5. Be adventurous! Be outrageous! Be Bugs! Where Bugs is always thinking and acting creatively, Fudd is weighed down by his knowledge. Where Bugs thinks on his feet, Fudd thinks on his head. He bases his plans and actions on what he has learned in books. Fudd depends on instructions, where Bugs wings it in the moment – full of grace and aplomb. Fudd is a dunderhead, heavy, predictable, and laughable. We laugh with amazement at the antics of Bugs, but we laugh with derision at the pondering stupidity of Fudd. 6. Know when it is “Wabbit Season” and when it is not. Where Bugs knows exactly when to employ his many schemes and tricks, Fudd is relentless with his single-minded plan. Bugs is always keenly aware of his environment exactly in the measure that Fudd is not. All Fudd cares about is getting Bugs. Where Bugs just loves the play and is all but indifferent to its outcome, Fudd is passionately addicted to only its outcome and thus “winning”, which always means capturing Bugs or even killing and eating him. 7. Always leave ‘em laughing. We laugh with Bugs, but we laugh at Fudd. Where Bugs is fun, Fudd is just a painful dunce. He is the straight man, all zippered up, all ready to flail at life and fail at life. 8. There are no small cartoon characters, only small people. Neither Bugs or Fudd are people, rather they are archetypes and the whole purpose of this post is to explore the contrasting archetypes of he who plays at life using alert observation and a heart who knows the enduring value of joy as opposed to he who works at life and is always motivated by what he lacks, instead of what he might possess. This is something we really never come to know about Fudd. His actions are so knotted around lack, that we rarely see his gifts, but they are there. He is a bit of a curious chap, eager to learn. He yearns to be loved, but then does everything possible to spurn that affection. 9. Live to be over fifty years old, with only one gray hare. Let’s face it, Bugs and Fudd are cartoon characters who don’t age, yet there is something wonderful and child-like about Bugs, while Fudd is the perfect grown-up. He never questions any of the rules and structures within which he lives. Bugs does possess an adult-like cunningness, which Fudd also lacks. Fudd tries to be cunning, but because he so attached to his rules and his head, he is always outwitted by Bugs. It’s easy to see that Bugs lives in the now and Fudd lives in his thoughts. 10. Take life lightly — and Bugs seriously. (for those very careful readers, I have skipped Kristal’s point 10 because it doesn’t really apply to our topic). Bugs, of course, takes nothing seriously, not even the prospect of his own death and demise. As we have already discussed, Fudd takes everything seriously, except that which might enable him to finally capture his prey!. Invariably, Fudd ignores the one essential detail that might enable to win and that’s because his focus is so narrow. And isn’t that exactly what a serious mind does? It’s focus is usually so narrow that it misses the forest for the trees. Where Bugs is so fully and unashamedly expansive, Fudd is fully contracted. This is the difference between living life as play and a living life as purpose. For Bugs the fun is in the now. For Fudd the pleasure is always later. The trees are wonderful, but don’t forget the woods. 11. Carrots are divine, you get a dozen for a dime. Bugs loves carrots. They’re plentiful and easy to find. His life doesn’t become an agonizing chore designed around unattainable and expensive goals. It’s just not so for Fudd. He want’s only what he can never have. And isn’t that the very metaphor of those of us who have projected the Nirvana of enlightenment and have thus motivated us to set out on a journey whose goal lives only in the imagination? Bugs shows us, in no uncertain terms, the immediacy of awakening right here and right now. It can’t be so for hapless Fudd whose happiness depends exactly on that which he can never have. 12. Monsters are such interesting people! Where Bugs embraces the world as a place of fun and beauty (and even mystery now and then), Fudd’s already knows all about what is good and bad. He lives in the universe of the strict moral patriarch. He is incapable of understanding the mastery of Bugs, because he’s so locked into his own knowingness. He knows what is ugly and what is beautiful. In fact, Fudd is shown to have an appreciation for what most of us believe is beautiful, but his is a very small world when compared to the immediacy of love and engagement that Bugs manifests in his own life. 13. Bugs is a karma free religious symbol. Bugs is an actor and a lover. Fudd is incapable of play and very much a killer. It is certainly not a coincidence that his most common role is that of a hunter (he also has a series where he is depicted as a super-rich capitalist where he is love with nothing but luxury). Where Bugs transcends the world of karma, Fudd does little else than produce more and more negative karma. Bugs lives in perfect balance and harmony in his world, while Fudd is a product of hard-headed and hard-hearted civilization. He is the very force and incarnation of lack onto the placid, fluid and tranquil world of Bugs. 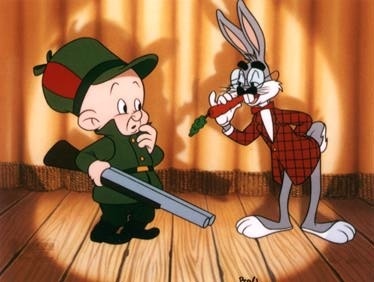 Where Fudd ceaselessly uses force, if only to show us his impotence, Bugs uses power in the form of a continuos creative connection with his world. And thus we fall in love with Bugs. We are made to feel happy that we are nothing like crabby, stupid, and styleless Fudd. Alas, most of have a lot more in common with Fudd than Bugs, but Bugs shows us the way and Fudd holds up the mirror showing where it is not. Yet, at the end of the day, Bugs truly needs and loves Fudd and Fudd needs, if not loves, Bugs. Thus is the yin and yang of Bugs and Fudd – of seriousness and play – of life and death. This entry was posted on June 11, 2010, 2:15 pm and is filed under liberation, Life, love. You can follow any responses to this entry through RSS 2.0. You can leave a response, or trackback from your own site.